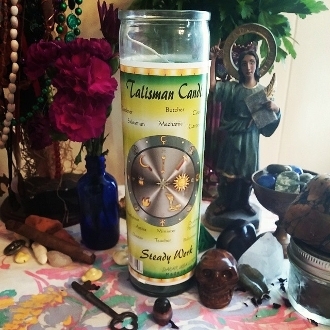 This listig is for one, full-sized, 9-day candle which has been fully dressed and blessed by me. You will also receive a 1/2 ounce bottle of my custom prosperity oil blend! Work this set to bring you steady work, a new job, better business and/or more customers! I choose to work with Ogun or Oya for business or employment concerns. Dress and then light this candle on a Tuesday (for Ogun) or Wednesday (for Oya). Dress and burn each day until it is gone.